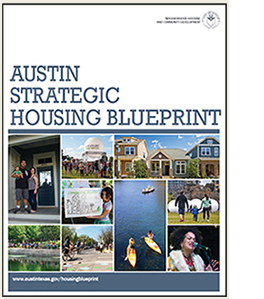 At the direction of the Austin City Council an Interdepartmental Action Team has drafted a Strategic Housing Blueprint Briefing Book to to identify the specific steps and resources necessary to achieve the specific goals of the Housing Blueprint in Resolution No. 20170413-024, and strategies for affordable housing preservation to avoid significant loss of existing affordable housing in Resolution No. 20170413-025. In the spring of 2017, the Austin City Council adopted the first ever Austin Strategic Housing Blueprint. The document helps align resources, ensures a unified strategic direction, and facilitates community partnerships to achieve this shared vision. The plan identifies funding mechanisms, potential regulations, and other creative approaches the City of Austin should utilize to achieve housing goals--including the creation of 60,000 affordable units over the coming decade for households earning approximately $60,000 or less per year--in line with Imagine Austin. -- Help Austinites reduce their household costs. The Austin City Council has directed the City Manager to create an Interdepartmental Action Team to coordinate implementation steps for each of the Key Actions, and to document progress and obtain ongoing public feedback. The specific steps and resources necessary to achieve the specific goals of the Housing Blueprint in Resolution No. 20170413-024, and strategies for affordable housing preservation to avoid significant loss of existing affordable housing in Resolution No. 20170413-025. Blueprint Implementation Plan: Stakeholder engagement and use of the Atlas and Corridor Analysis to create detailed, schedule-driven action items based on each Blueprint strategy. Austinites are encouraged to review both documents and to submit comments until December 31 at NHCD@austintexas.gov or by mail at NHCD, P. O. Box 1088 Austin, Texas 78767.